Gant Classic Nostalgia Steering wheels The Nostalgia Wheels are designs patterned after some of the most popular classic designs of the ‘60’s muscle car era. 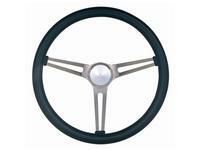 The wheels feature genuine hardwood or thick foam cushion grips. 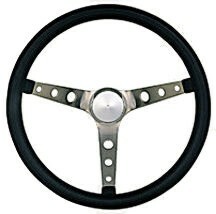 That will add style and comfort to any vehicle. Grant Classic Nostalgia Wheel. 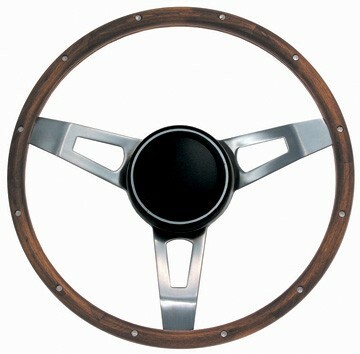 Mopar Tuff Wheel design with genuine hardwood walnut finish grip. The spokes are CRS steel with a satin nickel plate (OEM look) finish. 15" diameter, 1-3/4" dish. 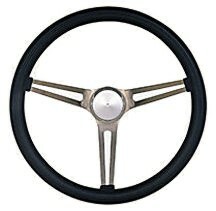 Grant Classic Nostalgia GM Wheel. Genuine hardwood walnut finish grip with brushed stainless steel spokes, 3 spoke slotted design. 15" diameter, 4-1/8" dish. Grant Classic Nostalgia Wheel. Black foam cushion grip and brushed stainless steel spokes, 3 spoke design. 15" diameter, 4-1/8" dish. Grant Classic Nostalgia Wheel. Black foam cushion grip and brushed stainless steel spokes. 15" diameter, 4-1/8" dish. 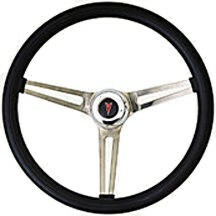 Grant Classic Nostalgia Pontiac Wheel. Black foam cushion grip and brushed stainless steel spokes, 3 spoke design. 15" diameter, 4-1/8" dish. 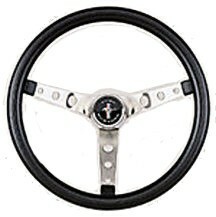 Grant Classic Nostalgia Mustang Wheel. 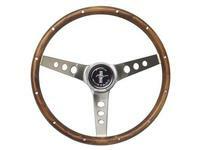 Genuine hardwood walnut finish with finger grips and brushed stainless steel spokes, 3 spoke design. 13-1/2" diameter, 3-3/4" dish. Includes #5847 Mustanger horn button. 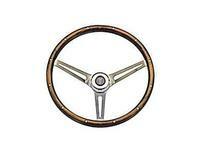 Grant Classic Nostalgia GM Wheel. Genuine hardwood walnut finish grip with brushed stainless steel spokes, 3 spoke slotted design. 15" diameter, 4-1/8" dish. 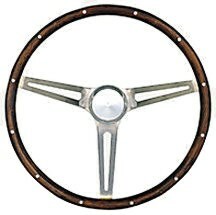 Includes Chevrolet logo horn button. Grant Classic Nostalgia Wheel. Black foam cushion grip and brushed stainless steel spokes, 3 spoke design. 15" diameter, 4-1/8" dish. 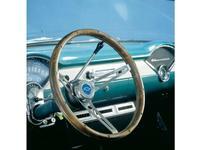 Includes #5847 Mustang horn button. 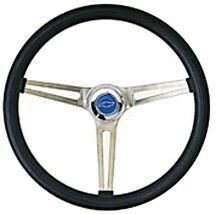 Grant Classic Nostalgia GM Wheel. Black foam cushion grip and brushed stainless steel spokes, 3 spoke slotted design. 15" diameter, 4-1/8" dish. 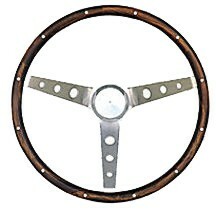 Includes Chevrolet logo horn button. 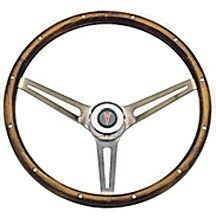 Grant Classic Nostalgia Pontiac Wheel. Genuine hardwood walnut finish grip with brushed stainless steel spokes, 3 spoke design. 15" diameter, 4-1/8" dish. 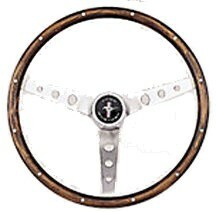 The wheel is shipped with a brushed stainless steel horn button with Pontiac logo. 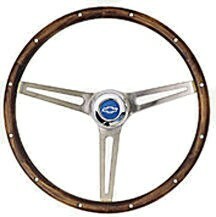 Grant Classic Nostalgia Pontiac Wheel. 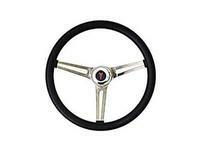 Black foam cushion grip and brushed stainless steel spokes, 3 spoke design. 15" diameter, 4-1/8" dish. The wheel is shipped with a brushed stainless steel horn button with Pontiac logo.